Though pasta is an Italian dish, there are numerous variations depending on local flavours and taste. This is one such variation and is more of a Chennai style Vegetable Pasta. Makes a great after school dish for children. 3. Add the onions, green chillies, tomatoes, carrot and cabbage. 5. Add salt, little red chilli powder and 1 or 2 tsp of tomato sauce. 6. Mix well and cook for another minute. 7. Heat a pan of water over medium flame. 8. Add a little salt and bring to a boil. 9. Add the pasta and cook until tender (or aldente). 11. Add the pasta to the pan. Tip: If desired, garnish with grated cheese. 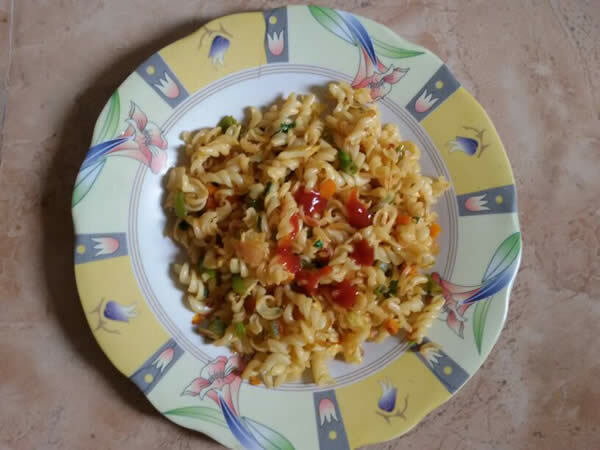 Feel free to comment or share your thoughts on this Indian style Vegetable Pasta Recipe from Awesome Cuisine.